H3N2 Spreading Rapidly Nationwide: Earlier, More Aggressive Flu Season Could Cost Employers $9.4 Billion | Challenger, Gray & Christmas, Inc. The aggressive strain of flu currently making its way across the country is prompting experts to issue warnings to reduce the spread of infections. One such warning is to stay out of the workplace during an illness. While this is excellent advice workers should follow, it is likely to lead to millions of lost workdays and billions of dollars in lost productivity. If workers take four sick days to recover from the flu, the cost to employers in lost productivity could reach over $9 billion, according to an estimate from global outplacement and executive coaching firm Challenger, Gray & Christmas, Inc.
“The current strain is particularly aggressive and those who are sick can be contagious for up to seven days. Workers who have the flu or need to care for someone with the flu should absolutely not come into work. This is exactly why employers have sick leave benefits,” said Andrew Challenger, Vice President of global outplacement consultancy Challenger, Gray & Christmas, Inc. According to the Centers for Disease Control and Prevention (CDC), over 18 million people over the age of 18 suffered from the flu during the 2015-2016 season. Additionally, employed adults aged 18 and older averaged four work-loss days due to illness or injury in the past 12 months, according to the CDC’s National Health Interview Survey published in 2014. To arrive at its estimate, Challenger looked at the number of illnesses for those over the age of 18 in the previous flu season, used the current employment-population ratio of 60.1 percent, and the average hourly wage of $26.63. With over 11 million estimated employed adults missing four eight-hour shifts, the cost to employers could reach $9,415,586,823.84. 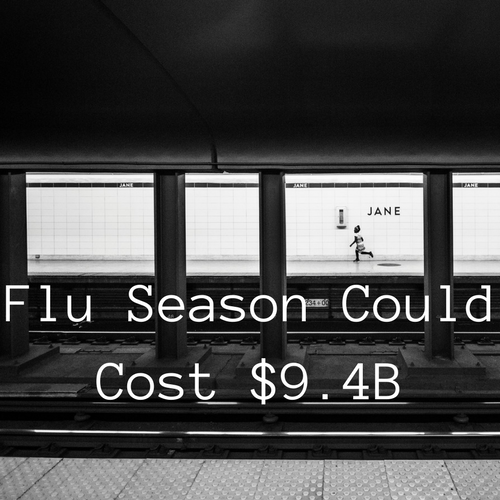 “The 2014-2015 flu season was the worst in recent years, according to the CDC. This year’s flu season is on pace to be similar, if not worse. Employers should prepare to see a number of absences in the coming weeks,” said Challenger. “One way to prepare is to make sure managers train staff on all responsibilities necessary to the functioning of the department in the event of team members’ absences. This will not only help prevent any lapses in work to customers and clients, but will also give employees the opportunity to increase their skill sets,” added Challenger. Employers should also consider expanding telecommuting and remote work opportunities if they begin to see the virus spread, thus stifling further infection. “While sick workers may think they are doing the right thing by ‘toughing it out’ and coming into work when they feel ill, they are only likely to spread their illness, potentially further interrupting optimum business operations. Whether it is motivated by job security or a desire to continue making a contribution in an overburdened workplace, presenteeism, as it has come to be called, should be strongly discouraged by employers,” said Challenger. Institute flexible leave policies to allow parents to care for an ill child or one who is home due to school closures.